William Blake was the son of a hosier. He left school at ten but his mother Catherine Blake (born Wright) educated him at home. He started engraving copies of drawings that his parents bought for him. He was allowed to attend Pars's drawing school at the Strand. In 1772 he became apprentice to the engraver James Basire, who made him copy images from gothic churches. When he was 21 he became a professional engraver. In 1779 he started studying at the Royal Academy, but he rebelled against the views of its president, Joshua Reynolds. He befriended John Flaxman and George Cumberland. When Newgate Prison was stormed in 1780 by a mob Blake was there. In 1782 he married Catherine Boucher, who was illiterate at the time, but she assisted him with printing and through his life she would help him through difficult times. Around 1783 his "Poetical Sketches" was published. In 1784 he opened a printshop with his former fellow apprentice James Parker, working for Joseph Johnson. In 1791 he illustrated Mary Wollstonecraft's "Original Stories from Real Life" but they may never have met. In 1800 the Blakes moved to Felpham, Sussex, where they lived in a cottage. In 1803 he was in trouble for assaulting a soldier and allegedly insulting the king but he was cleared of the charges. He returned to London in 1804 where he started his "Jerusalem" (1804-1820). In 1826 he was commissioned to illustrate Dante's "Divine Comedy", but he had only completed a few watercolours when he died in 1827. He had spent his last years at Fountain Court off the Strand and was buried at Bunhill Burial Fields. Catherine died in 1831 and was buried beside him. 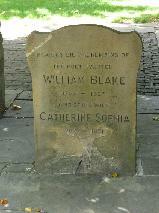 The grave of William Blake at Bunhill Burial Fields, London.